Kiribati – pron. Keer-i-bas – is perhaps the world’s most immediate victim of climate change. One hundred and ten thousand Kiribatians will likely be the first climate change refugees. It is happening right now, and they will be the first of millions over the next decades. This is a two-part post. Part one explains the people and livelihood of Kiribatians and explains their plight. Part two examines the many real and surprising difficulties posed by moving a very old culture to another country. The story told is very much a proxy for many other countries threatened by sea level rise – Maldives, Seychelles, Torres Strait Islands, Solomon Islands, Micronesia, Palau, Tuvalu and Bangladesh to name a few. Climate change (CC) is real. Some debate continues about the cause, but the climate is changing. Most people are familiar with the notions that CO2 levels are rising, as are global temperatures. The oceans are becoming more acidic, ice caps are melting, the oceans are getting warmer and many other “symptoms” are emerging. It is easy to perceive that climate is changing so slowly relative to our lifetime that we need not be alarmed. Many do not seem to see an immediate risk, only a distant threat. That view is not challenged by all governments in Australia. However, CC is profoundly affecting the citizens of the Republic of Kiribati in the Central Pacific. The group of 33 atolls, has an average height above sea level of less than 2.5 metres. Much of the land is only a few hundred metres across. Half the population live on Tarawa Island, the highest point being just three metres above sea level. Figure 1. The location of Kiribati, a nation made up of the Gilbert, Phoenix and Line Islands. The red outline depicts the United States and illustrates the geographical spread and isolation of Kiribati. Only one of the Phoenix Islands group, Kanton, is inhabited, and just three of the Line Islands are populated. Source: Google Images, 2017. The people, known as I-Kiribati, are mostly Micronesian in origin, and have been present on Kiribati for approximately three thousand years. It is truly their place and there are immense bonds to their land that are central to their very livelihood and wellbeing. Kiribati is not facing some distant threat, it is the subject of a clear and present danger right now, to borrow a Tom Clancy title. Two main processes are contributing to sea level rise and associated stresses. One is the melting of land-based ice. The other is the thermal expansion of the sea as it warms. 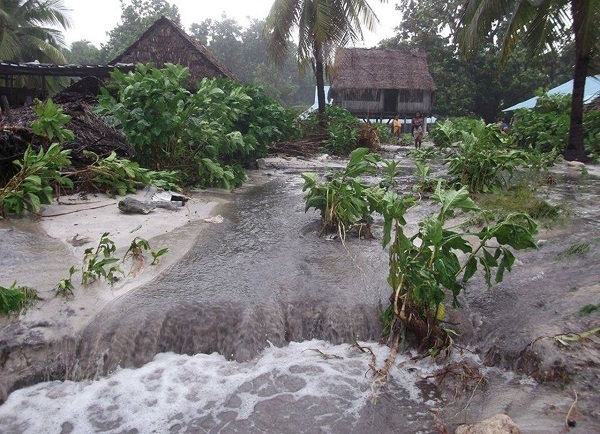 Sea level increase and its effects on Kiribati is exacerbated by increased tides, storm surge, inconsistency of rainfall and acidification of the sea. NOAA records show that actual overall (global) sea level rise between 1993 and 2014 was 2.6 inches or 6.6 mm per year. The I-Kiribati, are routinely swamped during king tide and storm surge events. Sea level rise was estimated at 4 mm per year, but more recent evidence is suggesting a much faster rate. Data on observed sea level changes from most parts of the world suggest that sea level is currently rising faster than the 2007 IPCC projections, lending credibility to the higher alternative projections. Sea level rise is not some hypothetical future possibility – see figures 3-5 below. The images illustrate the situation right now in the Republic. Figure 3. King tide invading downtown Tarawa. Figure 4. 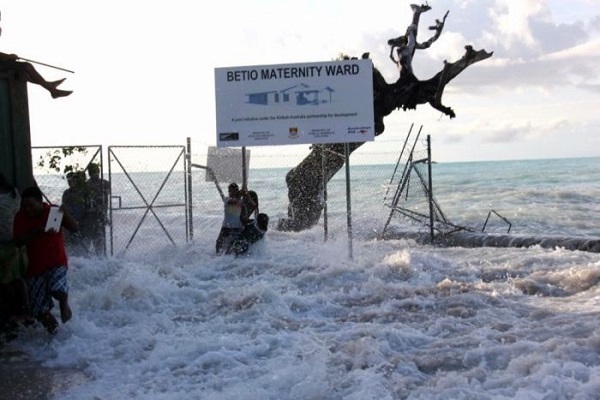 The Betio Maternity Wards being inundated during a king tide. Note the large tree that grew on dry land. 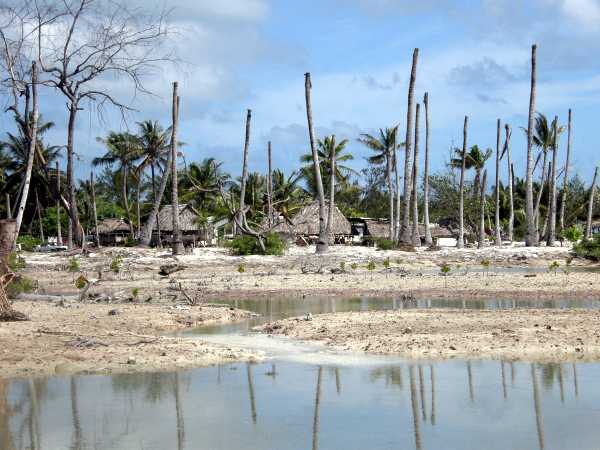 Betio is a part of Tarawa connected by a narrow strip of land now frequently flooded. Figure 5. This inundation is attributed to storm surge from cyclone Pam, 2015. Pam passed approximately 1000 km away from Kiribati. From Getty Images 2018. To be clear, the islands are not sinking, the sea level is rising. Underlying coral is not being dissolved by increasingly acidic ocean and causing the land to sublimate into the water. The islands sit on top of ancient seamounts and are likely to subside only in the event of a very significant and unlikely tectonic event. Google Earth shows this very clearly. The make-up of the islands is corals, sand and gravels from the early forming volcanic events. The land is thus somewhat permeable to water and this affects the local freshwater-saltwater relationship. Freshwater resources are very limited, especially given the small size of the island which links to the size of aquifers. 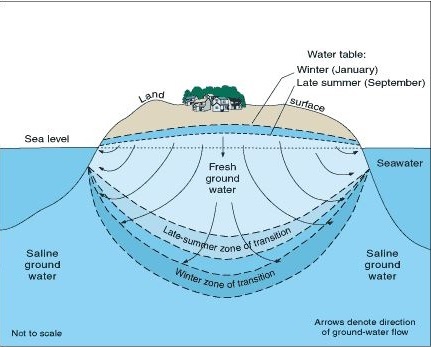 Figure 6 is a schematic of an island aquifer system, but it is not necessarily illustrative of Kiribati. Freshwater recharge is dependent upon rainfall. Precipitation patterns are expected to change, and annular variance is expected to increase because of CC. The rainfall may increase ~6% or decrease ~9%. The numbers are important. If rainfall drops 10%, that is a 14% loss of recharge. Or if rain increased by 7%, recharge would improve by 5.5%. Actual rainfall changes won’t be clear for some time, but a reduction is more probable than an increase. If that is the case, fresh aquifer storage will decline. In addition to the uncertainty of rainfall, there are other issues with the freshwater supply: seawater intrusion, pollution and over-drawn aquifers. Saltwater intrusion can be caused by high tides, especially king tides and storm surge. As the sea level rises, seawater intrusion will have an increasing impact of the islands water quality. The main crop, a form of taro, is highly salt intolerant and already crops are declining. The islands are poorly served by toilets and rubbish collection. As a result, human and animal waste finds its way into the drinking water, making it unsafe. A further issue is that some aquifers are over-drawn. Too much water is extracted, or the wells draw on incorrect levels – see Figure 6. Overdrawn aquifers are not sustainable and increase the concentration of chlorides. 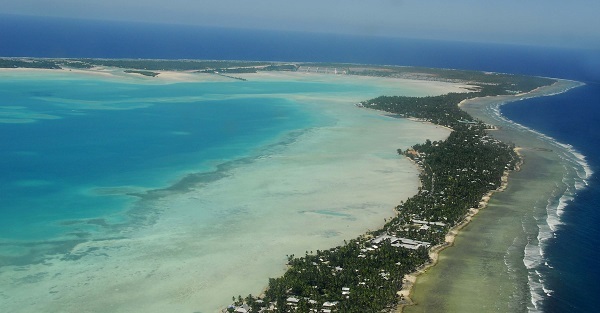 Kiribati depends on freshwater for drinking, cooking and agriculture. Salination and pollution of the water renders it unsuitable for those purposes. Freshwater quality and quantity are of the utmost importance and if the freshwater supply fails, the island will not sustain the present population. As the water supply is being lost, so too is the natural capital. The sea degrades agricultural land and contaminates fresh water. Land is lost as the shoreline is eroded by tides and storm surge. Coral is being lost both by erosion and bleaching. Because of lower aragonite saturation coral replenishment is reduced leading to the net loss of corals. If corals are not replaced, lower fish stocks force a growing reliance on less healthy western style imports. The natural capital items of fresh water, agricultural land, mangroves, coconut trees and seafood resources are being steadily diminished – see Fig 7 below. Figure 7. Lost foreshore, housing, mangroves and palms. Lost natural capital and built environment. As natural capital is lost the carrying capacity of the islands is reduced. Lost mangroves reduce the nursery space of many species of sea life. Fewer corals reduces the habitat for many sea species, including fish. Coconuts are an important export crop and an important food for I-Kiribati. Loss of agricultural land is happening for several reasons. The foreshore is being eroded – see figs 4 & 7. On Tarawa the birth rate is 4.4% and immigration from outer islands is increasing because Tarawa is perceived as having better employment options. Residential land then displaces agricultural land. To re-cap, Kiribati is being subjected to sea level rise that is impacting upon their freshwater supply, their food supply and the very land that is their home and repository of their culture. Their livelihood, so linked to their land for thousands of years is under dire threat. Sea levels will continue to rise, and recent evidence is that the rate of rise is increasing. What can be done? It is fair to say that continued sea level rise is unstoppable. Even if we rein in the anthropological factors, the sea will continue to rise beyond what is survivable for Kiribati and other threatened places. There are four general options. 1. Engineer seawalls, elevate buildings etc. 2. Live with the hazards. An example is the Netherlands. 3. Leave the local area. Relocate to higher less vulnerable land. The first option might offer temporary relief with respect to built environment. But seawalls invariably fail to the relentless sea that undermine foundations and tear walls down by the sheer force of waves. The second option, living with the inundation is possible in the short term. Elevating buildings and re-wiring/plumbing is unlikely to be favoured as a long-term solution. Option three – relocate – is possible but relocating on Kiribati is not possible because of its low topography. Even if these options were available, the problem of inadequate fresh water and food supply would make the islands uninhabitable, perhaps as soon as 2030. Option four, abandon the land and relocate the population appears as the inevitable step. Former President Tong, after leading for the maximum 12 years stepped down in early 2016. Tong worked hard at seeking help from the international community to deal with the problems of rising sea level. Pashley 2016 cites Tong as saying that “Islanders will start leaving Kiribati in 2020 as rising seas make life too difficult…” In 2014, President Tong finalised the purchase of 20 Km2 of land near the village of Naviavia, Fiji’s second largest island, of Vanua Levu. A brief video of the new land is at http://www.alantoth.net/alan-toth-films/. Whilst Tong saw the need to secure the land on Fiji, his successor, President Maamau seems less committed to moving. His emphasis is on adaption and reliance upon Divine help. Maamau recognises the great distress of I-Kiribati at the prospect of leaving their homeland. He understands their fear of losing their culture, their very way of life. However, it is inevitable that the islands will need to be abandoned, and as mentioned earlier, the likely tipping point will be the loss of sufficient freshwater, sometime before inundation. Perhaps a gradual dignified migration to Fiji will eventuate. Tong saw that people would start leaving Kiribati around 2020 as the rising sea level made life too difficult. Current President Maamau may seek to change the timing but will eventually be unable to deny the need to leave. Will the people remain Kiribati nationals in their new country? What becomes of their sovereignty? How will the culture survive the transition? The move will take some years to achieve leading to some fragmentation of the people. What will become of the fishery rental from the exclusive economic zones? The new land on Fiji is quite different to Kiribati and is 1.5 km from the ocean, suggesting a considerable social impact upon arrivals. How will land be apportioned amongst arrivals. Presently Kiribati has mostly traditional ownership – can it be the same on Fiji? How well will the newcomers engage with the Fiji peoples? To summarise, Kiribati has an existential problem with rising sea levels due to anthropologically induced climate change. Sea level change for Kiribati is unstoppable, and the fate of the Republic is certain – it will first become uninhabitable and eventually be completely inundated. There are many such places facing the same fate. At this time, it is intended that the I-Kiribati relocate to Fiji where the Republic has a rare freehold property. But, as mentioned above, leaving the islands and relocating to land raises many issues to be dealt with. Those issues will need to be dealt with largely by the I-Kiribati, because they are the guardians of their culture. Because their migration may take over a decade there will likely be changes to their culture associated with that fragmentation. Part two of this paper will seek to address those issues and more. Geoff, it seems that freshwater availability and saltwater intrusion will be determining factors rather than actual inundation, and the problem is there now. The notion that a population of 110,000 will have to start moving as early as 2020 brings the issue into sharp focus. I don’t know whether there has been talk of desalination or recycling, but I imagine they would be too expensive and do nothing about saltwater intrusion to agricultural land from high tides and storm surges. BTW I’ve replaced Figure 6 with a slightly smaller but clearer version than the one initially published. Kiribati gets a good deal of international publicity about rising sea levels. But Australian territory – the Torres Strait Islands – is also being inundated – for example, see here. Perhaps these circumstances are still too remote/removed for our leaders to care? Cynically; not enough votes in it? Good one GH. Me, I would be getting the kids prepared for when they move to a new country. Brian desal requires a lot of energy that is not available except at great expense. In any event it would only buy short term relief. There are evaporative systems that require little energy but 55,000 people @ 80 litre/per person per day is 4.6 million litres per day is a bridge too far and leaves nought for agriculture. In the medium term the sea will prevail. Geoff M that is true for quite a few of the islands there. I should have included Torres Strait in my list of other nations at risk. One distinction is that Boigu Island residents can retreat to higher ground – at least it appears that way on Google Earth. The I-Kiribati don’t have that option. The story told is very much a proxy for many other countries threatened by sea level rise – Maldives, Seychelles, Torres Strait Islands, Solomon Islands, Micronesia, Palau, Tuvalu and Bangladesh to name a few. Lower latitudes will be first affected, in a great swath through the tropics from Africa to South America and throughout south-east Asia, with Europe’s Atlantic coast and the west coast of the US not far behind. 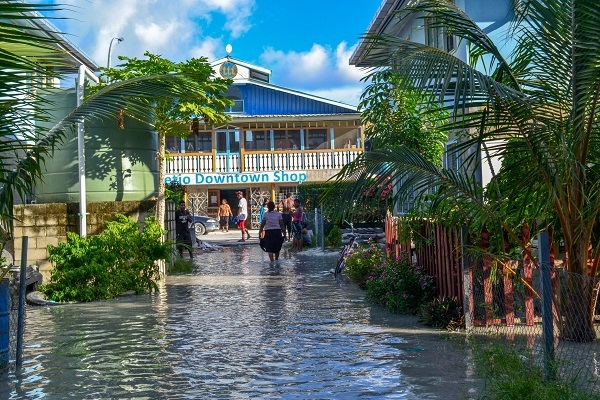 just 2.5cm of sea level rise leads to extreme water levels being seen twice as often, while a 5-10cm increase means coastal floods are twice as likely across all the tropics. A rise of 20cm leaves almost every coast with twice the risk. The article also cites research that suggests 2-3 metres is possible by 2100, contra what the IPCC said. Desalination does not require as much energy as one might think. This process is totally compatible with solar energy, to the extent that I wonder why Cape Town is not shipping in modular desalinators (perhaps they are). …that is two watt hours per litre (if I’ve read this properly). Not so energy hungry that it is not a serviceable permanent solution for many pacific locations, and when you know how the filters are made it is not impossible for them to be made locally to reduce the servicing costs down to very little. If Tarawa was my home I think that I would be fighting to preserve it for as long as possible (I say that without knowing the whole situation). Thanks BilB. I calculated that if all 55,000 souls on Tarawa used just 80 litres or water per day (which is a very low average rate) then the daily need is near enough to 4.4 million litres per day. And none of that for crops. I don’t think that is achievable by solar or any novel means I know of. However, if the exit progresses, there will remain a number of people who probably can’t face leaving. Perhaps a solar system will augment their more modest needs – ‘don’t know the number yet so it is hard. All that said, at some stage the island(s) will become uninhabitable just because the ocean will prevail over the land. There is a considerable reluctance from many I-Kiribati to leave. Understandable. I am thinking without research, that there will be an orderly exit by some who will want to embrace the new land, and others who might feel increasing pressure to leave over time. And there may be some who choose to die there – sort of like Harry Truman at Mount St Helens. It will be interesting to see what assistance the world offers too, given Kiribati is not responsible for the sea level rise. Australia, for 2018 has pledged approx. $31 million to build better roads or infrastructure. Yes, Harry Truman. I remember that. One cubic kilometre of ash. There is another consideration to the Kiribati problem that should be considered and that is that if the island is functionally abandoned, China would quickly move to claim it, and its territorial waters. The consequences go way beyond a few million dollars. Australia and New Zealand should consider that very carefully. We’re seeing what China can do with low lying atolls, and we have not yet fully comprehended their motives. Solar energy is doable. for 55,000 people getting 200 litres per day each would require 22,000 solar panels which is an array of panels 150 by 150. Not that many. The way this would be done is on a large raft in the middle of the lagoon. The raft would rotate during the day to track the sun, very efficient. From a structural point of view, it is not that big at all. It would be done as four rafts to reduce the cyclone damage risk and perhaps even be anchored with artificially grown mangroves. They would probably pay that off quite quickly if the islands were able to go completely solar reducing their petrol use to near zero, and using their biomass for building soil carbon for island building to mix in with dredged sand. Over time the sea water inundation of their fresh water would cease and they would have a very healthy energy supply for local industry. I think that the islands can be saved for a very long time without huge cost. Of course the 7 metre inundation scenario would be hard to fight, but then at that stage every one is in trouble. Wow BilB that’s huge! I’m going to have to dig into that because it can impact greatly on the exit strategy. You mentioned China and its island building. Maritime law has not really considered the situation that Kiribas is in, nor has the UN. So the soverignity of the nation is legally at risk as soon as there is no land above water. Then who owns the fishing grounds? Seven metres sea level rise? The average height of Tarawa is 2.5 metres and already king tides wash over large parts. The seven metre scenario is not worth considering as it is several hundred years off and the geopolitical landscape will certainly be very different by then. It is the one metre sea level rise that needs to be addressed, and it can easily be engineered around without great cost. BilB I have not fully researched Part 2 of the Kiribati story, but I had already started to dismiss desal as any sort of option. If desal is a viable option I’d like to know more about it ASAP. Cyclones don’t really happen along the equator in the tropical convergence zone, but there are effects (like storm surge) from regional cyclone up to 1000 km away. It would have downstream effects/implications. Already migration from outer islands is a problem and a more reliable water source will be an attraction. But it would extend the habitable life of the islands for at least some of the people. Engineering the housing – I guess you mean raising them on stilts – can be expensive and the population density is already very high. Another angle to with a solar desal plant is that it is a sort of honourable way the nations that caused the sea level rise can in some way atone for their climate change sins. There seems to be a reluctance to offer land to the people, except Fiji. I’ll see if DFAT is keen to talk about it at all. Anyway there is a bunch of stuff to consider for the second part of the Kiribati story. I will be greatly appreciative of any info or comments that help point the way forward. Geoff, I’ve been surprised at how much Perth water supply is depending in desal and recycling. The economics may be beyond a Pacific Island nation, but must not be too forbidding. Brian BilB says there are relatively low cost solar options for desal that might work for Kiribati. In Perth I think they took too much from the underlying aquifers. Many homes had/have their own bores. The CETO technology needs a fairly long ocean fetch to provide the consistent wave patterns preferable for wave energy. Alas Kiribati does not have that wind-driven swell needed for waves. Wave energy as a concept has been around for a very long time and many options have been tried but it has yet to be taken up on any scale. Carnegie has been on this development for quite a few years now so they may be very close to cracking it. To mount these panels and house the desal plant will require 4 off round 85M diameter pontoons which will be contained each by a 90M dia ring frame which will be anchored to the lagoon bed by mangrove plants which are intertwined with the frame. These mangroves will both anchor the solar frames and provide a natural screen. The pontoons will float within the frames and rotate during the day to point the panels at the sun there by increasing their effective energy collection. The pontoons will also contain water storage tanks. These pontoons might sound to be very big, but relative to the islands themselves they are tiny. For instance the island near the Chatterbox Cafe is 300 metres wide, so a pontoon on the lagoon side away from the shore will be relatively unobtrusive. With four such pontoons these can be spread out along the rim of the community. What I would envisage for the island building would involve a floating suction dredge taking sand from the inner lagoon and depositing it on the island surface section at a time over a number of years to build the island up by 1.5 metres. Over time buildings would be raised to the new surface level. A specialised crew can be very efficient at elevating buildings once properly trained and equipped. The sand placement process will require bio mass to provide the reinforced earth effect so this will be a long term project, which will employ islanders well into the future. The cost and financing is some one else’s expertise, but the strategic nature of the asset when properly considered would help logical partner nations rationalise the aid, I believe. This is an excerpt from a second linked desalination supplier to verify the 2 watts per litre energy consumption. That’s fantastic BilB and it will help shape my next effort. Have you got more stuff up your sleeve? Are you in the industry? Geoff H, you may have heard Late Night Live on the topic of Islands under threat– about the relocating families from the Cartaret Islands and the Marshall Islands. Carteret is as good as gone and have a decent prospect in nearby Bougainville, whence they originally came. The Marshall Islands have 2m average, and their position seems as almost as dire as Kiribati. GeofH, You might get your most sympathetic ear from the US ambassador to Australia, very vocal on China’s island snatching . A little more information GeofH. The pontoons to carry the solar panels and the desalination equipment would be made in sections perhaps a little like a flower with a central hub and “petals” and tied together. The pontoons could be made with ferro cement construction (look it up any detractors before you criticise), and serve as water reservoirs as well, with as much as 2.4 million litres capacity (max). This way the pontoons can be built on the islands using local labour. Ferro cement construction is extremely easy, even fun, and totally compatible with the nature of work in the tropics (very similar to thatching). During the island building water storage tanks can be embedded as the ground level is raised (this would also serve to reduce the amount of material required for the buildup). You mentioned water for farming, well there are some Dutch (you know, those people with all of that experience in reclaiming land from the sea) researchers who done a lot of work with salt water tolerant plants which include vegetables such as potatoes. Some more research to be done there. You might even find the Dutch willing participants. If the islanders did move to Fiji (lets not forget this would be moving into the cyclone zone) everything would have to be rebuilt, so they may as well stay put and make it work. I see this as totally doable, even the best and cheapest option by far. This item would be an important consideration. Yes there would be damage to the inner lagoon, but the islands will be totally lost without human intervention due to the rate of human induced sea level rise, so it is a mixed bag. The Maldives have done a lot of work on reef building on lattice structures and I would see this as being very important for the outer reef in the most exposed sections. A little known fact. Humans now move (the last figure that I have seen quoted) 10 times the amount of earth than all of natures processes combined, and we do that as we deplete the fossil fuels that took all of nature hundreds of millions of years to lay down. We have achieved this degree of earth moving power in the last 40 years only with the development of extremely powerful excavation machinery. So people who claim that humans could not influence nature are narrow visioned and totally deluded. Thanks for the information, BilB. I’m hoping to post on a New Scientist article on sand mining, which I found more than a little astonishing. The short story is that the world is running out of sand, would you believe, which is being mined recklessly and illegally in may places. In Indonesia 24 islands have disappeared due to illegal sand mining. I recall reading some years ago from Hansen, I think, that some time this century beaches as we know them around the world are going to disappear. Thanks Brian and BilB for those insights. Brian the islands under threat you linked showed Kiribati was not alone, and GeoffM mentioned other islands recently. Carteret people are fortunate in as much as they seem able to move to Bouganville about 80 km away and are apparently well received there. I googled the population and it came in at about 2,600. Now that dome is leaking and repair would be a massive undertaking. The Marshalls have a treaty with the US and it may be that their ~60,000 residents could relocate to the US if necessary. But like the I-Kiribati would probably want to stay on their islands. BilB came up with suggestions that might prove helpful to at least extend the occupation of the islands. It involves building up the land by taking surrounding materials and using solar systems to distill fresh water from the sea. I’m not sure that is a permanent solution but it may buy the Marshall Islands more years but eventually I think the sea will win. And if the dome fails that could make leaving imperative.